Backyard Summer Evening Movies. 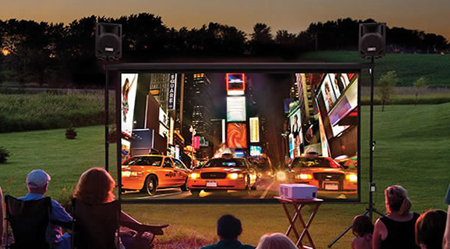 The HC 1040 is ideal for setting up the portable movie experience outside. All you'll need is an inexpensive portable screen that assembles instantly, a projector stand, some audio to suit your taste and an input signal. Indoor Ambient Light Video Display. The HC 1040 is perfect for having the neighbors over to watch a sporting event or have the family congregate to view Aunt Lizzie's videos from her recent vacation in the Bahamas. Ambient light should be no problem for most living rooms since the 1040 delivers over 2,000 lumens in each of its two Cinema modes. Physical attributes. The connector panel is at the rear of the 1040. As viewed from the rear the air intake is on the left side, and hot air is exhausted from the right front corner of the chassis. Horizontal keystone correction is via a slider located just behind the zoom and focus control above the lens. BRIGHTNESS. The Home Cinema 1040 is rated at 3,000 lumens. Our test unit delivered 3,065 lumens in Dynamic mode with a green bias not unusual for the brightest mode. The other three picture modes had better color balance but delivered slightly lower brightness readings. ZOOM LENS EFFECT. Since this model has a rather short 1.2x zoom range there is little light loss to worry about. At the maximum telephoto lens setting, brightness dropped only 4% compared to the wide angle end. With such a short zoom range it makes no difference which part of the lens you use. LOW LAMP MODE. Eco mode drops image brightness by 36%, but fan noise is dramatically reduced, and the trade-off may be worth it. BRIGHTNESS UNIFORMITY. With a uniformity of 80%, the 1040 is on solid ground for video viewing, but the slightly lower brightness in the upper right corner of our test unit was detectable on still projections with lots of white space. INPUT LAG. The 1040 has an input lag of 53 ms as measured on our Bodnar lag meter. This is fast enough for many gamers, but the 1040's sister product, the Epson HC 2040, is much quicker at 24 ms. Fan noise is typical for bright portable projectors of this size, which is to say it is louder than most home theater projectors. Most of the noise is in front of the projector, so audience members seated behind the 1040 may not find it objectionable. Deploying Eco mode reduces noise to a whisper. Since brightness is high to begin with, Eco mode may be the best choice especially for a small group. High altitude mode is required when the 1040 is operated at an altitude of more than 5,000 feet. Fan noise increases substantially in this mode, so Eco mode may be the best choice in this circumstance. Throw distance. To throw a 120" diagonal image in 16:9 aspect ratio, the 1040 requires a throw distance of between 12 and and 14.5 feet. To check throw distance for other screen sizes or aspect ratios, use the Projection Calculator which has been preloaded with the HC 1040 throw data. Since this is a native 16:10 model, make sure to select 16:9 if that is your intended set up. Vertical offset. With a 120" image displayed, the centerline of the lens intersects the screen at 5.8" above the bottom of the image. 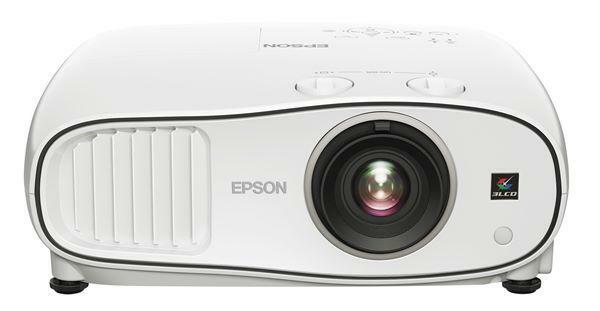 This is typical of many Epson projectors where about 10% of the image is below the lens centerline and 90% is above. Heading into summer, people are looking for backyard movie set ups for those warm summer evenings. The combined brightness, portability, and very high resolution of the Epson Home Cinema 1040 make it an ideal solution for portable backyard use. It puts up a beautiful video image for the money, and is a good choice for casual gathering either outdoors or indoors where high resolution and brightness are the chief requirements. As a side benefit, it is one of the least expensive full WUXGA resolution projectors in production at this writing, so if you need it to double as a high res 1920x1200 data presentation projector, it's all ready to go. In the end, it's an excellent value at under $799. Just as importantly for buyers in this price range, the replacement lamp runs a mere $79 from Epson ... the best deal in replacement lamps in town. All in all, terrific bang for the buck! Hi Allan, Thanks for the great article. Very informative. So....I just purchased a 9' by 16' screen for outdoor viewing, and am in the market for a projector. I tested it out over the weekend with my old Mitsubishi HD1000 which is a back up PJ that i have, and was surprised at the quality of the picture...even with this older 720p projector with 1500 lumens. That said, i still would like to go to 1080P for this outdoor theater, and bump up picture brightness as well.....but i want to do it on the cheap since this PJ will be only for outdoor viewing. My original thought was the Optoma G25, but lately I have been leaning toward this Epson 1040 due to the supposed higher color brightness. Can you tell me if you think im moving in the right direction with the Epson 1040? Thanks again for great article, and also for your input!! 600 dollar projector with no audio out port. Complete piece of trash for home theater. Not worth the money, get yourself a pocket projector. At least with those you can hook them up to some decent speakers. You are forced to use the built on deal on this thing with no work around. Has tons of potential but into lately worthless unless you are deaf or dont need audio. @ Ryan, don't get too upset about the audio. This unit puts out 2000 video optimized lumens, which means it is designed for very big screen use. You would not loop an audio output from the projector to a speaker. Most people using this projector will have an AV receiver and drive an independent surround sound system with it, and for these users the lack of an audio output is irrelevant.